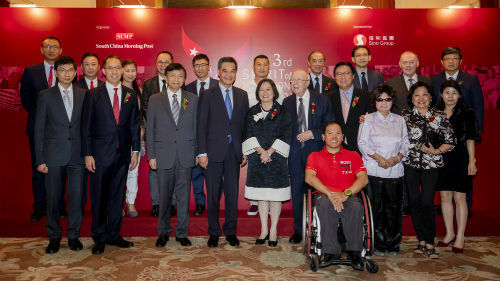 Eight unsung heroes and enterprises, whose charitable acts touched the lives of numerous Hongkongers, were honoured at the Spirit of Hong Kong Awards presentation dinner last night, an occasion graced by the Honourable C Y Leung, Chief Executive of the Hong Kong Special Administrative Region, as the Guest of Honour. Created by the SCMP Group in 2013 to shine a light on Hong Kong’s exemplary citizens, the Awards received tremendous support from the community in terms of nominations, judging and voting, and Sino Group’s generous sponsorship for the third consecutive year. With this support, the Awards grew and expanded their scope and depth in unearthing inspiring stories and selfless acts in Hong Kong. At the ceremony last night, held at Conrad Hong Kong, the Spirit of Hong Kong Awards winners shared their heart-warming stories with a full house of finalists, representatives from the nominating organisations and guests. The awardees’ good deeds towards those less fortunate and the community at large, as well as their perseverance in overcoming personal adversity, captured the hearts of the guests. In attendance last night were respected members of the society, including Patron of the Awards Sir David Akers-Jones, Chairperson of the Awards’ panel of judges Professor Frederick Ma Si-hang, and fellow member judges the Hon. Ronald Arculli, Mr. James Blake, Ms. Shelley Lee Lai-kuen, Sino Group Executive Director Dr. Daryl Ng Win-kong, the Hon. Anna Wu Hung-yuk and Chief Executive of The Hong Kong Council of Social Service Mr. Chua Hoi-wai. At the third Spirit of Hong Kong Awards presentation ceremony are (front row from left) Hong Kong Council of Social Service CEO Mr Chua Hoi-wai, Sino Group Executive Director Dr Daryl Ng Win-kong, SCMP Group Chairman Dr David Pang, Guest of Honour Chief Executive the Hon. C Y Leung, the Hon. Anna Wu Hung-yuk, Sir David Akers-Jones, Mr Foo Yuen-wai (Overcoming Personal Challenge Award winner), Professor Frederick Ma Si-hang, Tong Siu-yin (Cultural Preservation Award winner), Ms Shelley Lee Lai-kuen, Mrs Katy Blake, (back row from left) SCMP Editor-in-Chief Mr Wang Xiangwei, Dr Tsoi Wing Sing, Ken (5th Vice-Chairman of Tung Wah Group of Hospitals, representing iBakery, Corporate Citizen Award winner), Ms May Yam Siu-fong (Community Contribution Award winner), Mr Ricky Yu (CEO of Light Be, Lion Rock Entrepreneur Award winner), Professor Ronald Li Tang-wai (Innovating for Good Award winner), Mr Chan Kwong-hing (People’s Choice Award winner), the Hon. Ronald Arculli, Mr Chan Ching-kooi (representative for Mr Ko Cheung-chuen, Compassion Ambassador Award winner), Mr. James Blake and SCMP Group CEO Robin Hu. Stories of the 22 finalists of the Spirit of Hong Kong Awards 2015 were captured in feature articles in the South China Morning Post and on SCMP.com in the summer. These finalists were selected from nominees recommended by 14 organisations: the Association for Conservation of Hong Kong Indigenous Languages, Community Art Network, Community Business, Designing Hong Kong, Hong Kong Arts Centre, Hong Kong Professional Teachers’ Union, Hong Kong Red Cross, Hong Kong Science and Technology Parks Corporation, Mother’s Choice, Social Ventures Hong Kong, St. James’ Settlement, The Nesbitt Centre, The Samaritan Befrienders Hong Kong and Tung Wah Group of Hospitals. Tung Wah Group of Hospitals set up the first iBakery café in Kennedy Town as a social-enterprise store with a baking area to cater to a growing number of supportive customers and corporate clients. At its seven facilities across Hong Kong, iBakery employs 60 staff, more than half of them adults with special needs, including Down’s syndrome and autism. The social mission of iBakery is to train people and show that people with disabilities can be happy and productive. It is about inclusion in the community. iBakery has teamed up with hotel groups and others to provide cookie recipes and training for the staff. Light Be, the brainchild of Ricky Yu, provides much-needed housing for single mothers and underprivileged families in Hong Kong. His discontent with the long waiting list for public housing jolted him out of his successful career, after which he devoted himself to finding landlords with a philanthropic outlook, help renovate their properties and rent them out at affordable rates. His labour and commitment have helped many families put a roof over their heads. May Yam has never stopped helping others even when she was tackling her own struggles. She has volunteered for the Samaritan Befrienders Hong Kong hotline since 1997 and expanded her role to its executive committee in 2003. She has gone through two divorces, battled with thyroid cancer nine years ago, brought up three children and is now running a bookstore. Always looking at life with positivity, May used her experience to help others through the Samaritan hotline and she believes she is learning how to do it better every day. Ko Cheung-chuen devoted four decades of his life teaching secondary school children. Once a teacher in a Band One school in Wan Chai, he realised that there just might be other students that needed his help more. So he quit that school and moved to a far more challenging one in Tuen Mun. Tackling discipline problems and, at times, fending off gangsters from school area were just some of his challenges. Mr Ko helped students academically, but more importantly, he inspired them to lead a meaningful life beyond the classroom. Now in his retirement, he continues his mission at times as a supply teacher and a father figure to many of his schoolchildren. Losing her eyesight before the age of two, Tong Siu-yin overcame this twist of fate and supported herself as a telephone operator. In 2008, she fell in love with naamyam (南音), “music of the south” – a genre which blind singers in ancient China used as a way to make money travelling from village to village. While conservationists race against time to preserve naamyam in Hong Kong, Ms Tong is doing her part to keep this tradition alive through live performance and recordings. Professor Ronald Li is the Founder of Novoheart and a Director of the Stem Cell and Regenerative Medical Consortium at the University of Hong Kong. Using only 2.5 ml of blood from a patient, Professor Li is able to create a mini-human heart within six months, which can be used to show any adverse effects before a drug is given to the patient. For example, cancer drugs can be tested on the mini-human heart for any cardio effects. It is believed that this bio-artificial heart approach has huge potential in the development and testing of drugs, as well as organ transplant. Foo Yuen-wai is wheelchair-bound but that does not deter him from pursuing his sailing passion. With the help from a charity called “Sailability Hong Kong”, he not only tried his hands at the sport, he showed such talent that he represented Hong Kong in international competitions within the first year of sailing. He is now shooting for a chance to quality for the Paralympic Games in Rio de Janeiro next year. His perseverance is admirable and inspiring. For the past three decades, blood donations have become a habit for police officer Chan Kwong-hing. After 256 blood donations and two bone marrow donations, he is well qualified to educate the public about the importance of blood donation. In person, he encourages people to consider bone marrow donation and he is keen to emphasise that it is less painful that generally feared. His bone marrow has helped the same patient twice, using different bone marrow extraction techniques.